Working in the film industry has clearly influenced the brilliant lighting and colour choices Samuel Michlap makes in his paintings. He has some great concept art on his blog too, where you can see how his painting is influencing him as a production designer and art director. On a separate note, it has been an eye opening month for me, being away from PaintBlog. I missed the daily routine of discovering and sharing a new painter every day, but I also discovered that I had many more hours available to work on my own paintings. I have been very disappointed with my output this past year and a half, and have come to the realization that I have to narrow my priorities, which unfortunately means much less PaintBlog, and much more painting. PaintBlog will remain, but my posting will be limited and somewhat sporadic from here on out, which hopefully will mean my work will be less so. Thank you to everyone who has read and supported the blog these past years, and I look forward to sharing more work with you in the future, both from other artists, and my own. This entry was posted on Friday, April 2nd, 2010 at 10:38 am	and is filed under Gouache, Oils. You can follow any responses to this entry through the RSS 2.0 feed. You can leave a response, or trackback from your own site. Great to see the work of Samuel Michlap. thanks for posting. It is my feeling as an artist that it is difficult to keep up with the posting frequency necessary for a great blog without it affecting one’s own art time. Here’s to painting. and sporadic blogging. ha ha. Very cool. I’d love to see them in person. Glad to see you posting again. It’s been a nice source of inspiration. It seems there is a time to reap and a time to sow. (ie; a time to blog and a time to paint) I miss your daily blogs, but I too have been realizing that I can spend ALL of my time on line. My new rule is I must paint each day before I go onto my computer. Here’s to your new wave of creativity! Enjoy! Undoubtedly very talented artist. 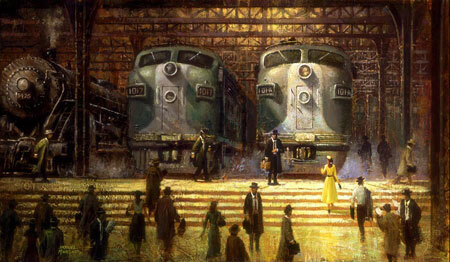 Urban oil series masterfully recreate feel and atmosphere of 40’s. Hi! Your site is beautiful, congratulations! Thank you for sharing Great painting!